We are looking forward to attending the HPAI Conference Exhibition on 6 April 2019 in the Crown Plaza Hotel, Santry. 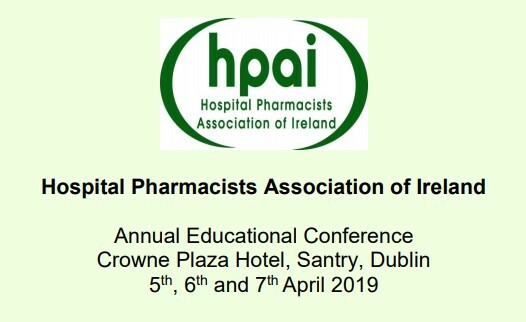 The Hospital Pharmacists Association of Ireland (HPAI) annual conference is the best opportunity for Hospital Pharmacists to meet up with colleagues from around the country. This is an educational conference with morning and afternoon workshops that are designed to enhance our members knowledge in key clinical and managerial areas with workshops to suit both newly graduated pharmacists and more experienced members. The AGM for HPAI members takes place during the conference. Members can table motions for discussion and includes selection of national executive members. The conference would not be complete without our Gala dinner to celebrate achievements and contributions to Hospital Pharmacy with invited guests from other disciplines and noted dignitaries. A poster competition is available to all members who contribute to health research throughout the year and has showcased many examples of informative and innovative work carried out by Hospital Pharmacists to improve all aspects of patient care. For more, please see the HPAI website.